Donna Montez Real Estate – "Going Above And Beyond"
Are You Looking To Save a Little Money on the Purchase of Your First Home? Itching for the key to unlock your dream of a new house? Here’s yet another reason to love your country: The U.S. has plenty of programs and incentives that could make that goal a reality. If you’re a first-time buyer—and even if you’re not, in some cases—there are some government benefits that can help you afford those new digs. Before we dive deep into the ways the government can help fund your new home, there’s a little matter to clear up: your eligibility. An individual that hasn’t owned a principal residence during the three-year period ending on the date of purchase of a new property. If a spouse meets this test, the couple does, too. A single parent who owned a home only with a former spouse while married. A displaced homemaker who owned only with a spouse. Someone who owned a property that didn’t comply with state, local, or model building codes—and couldn’t be brought into compliance for less than the cost of constructing a permanent structure. If any (or a few) of those statements sounds like you, these options could make a move even more affordable. The folks at HUD grant money to a myriad of different organizations and services that can help first-timers purchase a home. From loan programs that offer lower down payments to special programs for teachers, firefighters, and a few other vocations, HUD’s resources are vast and diverse. HUD even offers federal assistance at the state level, so make sure to see if your state is covered. In addition to HUD assistance, states such as Illinois, Ohio, and Washington have down payment assistance programs for first-time buyers. Eligibility criteria vary by state, but often factor in your income and the value of the property you’re hoping to purchase. If you qualify, you could score financial assistance with down payment and closing costs. You might also net some monetary relief to rehab or improve a property. Active-duty and veteran families might be eligible for a zero-down payment Veterans Affairs home loan. It’s part of a benefit program that’s helped millions of veterans and military members purchase a home since World War II. While loans typically top out at $417,000, that limit can swell in counties with higher costs of living. Not only do these loans allow borrowers to sidestep down payments, service personnel can also roll the mortgage insurance of 2.15 points (a point is equal to 1% of the loan amount) into the loan. More and more veterans are using these flexible, $0 down loans to crack the housing market during a time of tight credit and limping wages. 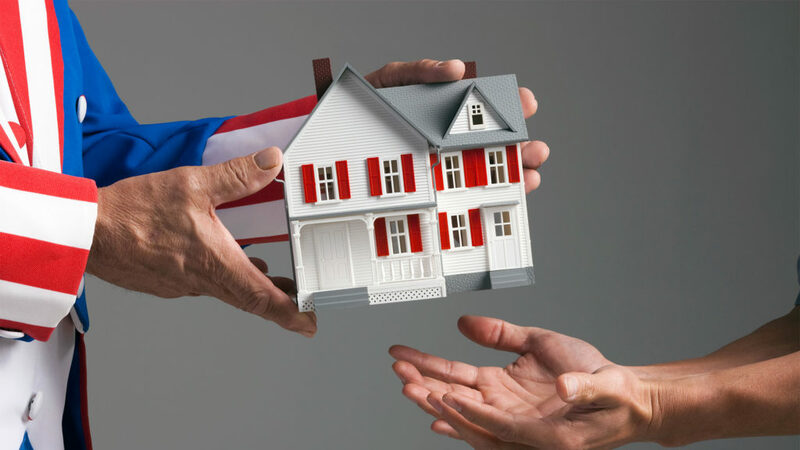 For more information, consult with a VA home loan provider such as Veterans United Home Loans. Native American first-time buyers can apply for a Section 184 loan, which lets them buy a home with as little as a 2.25% down payment on loans of $50,000 and more. If you need a loan for less, the down payment dips to 1.24%. Unlike traditional loan approvals that are heavily dependent on a borrower’s credit score, these hinge on the prevailing market rate. There is a small catch: Section 184 loans are applicable only to single-family homes that are for a primary residence. That trusty tool you’re using to fund your golden years can help put a new roof over your head while you’re still young(ish). First-time buyers can pull up to $10,000 during their lifetime from their traditional or Roth IRA without being whacked with the 10% early withdrawal penalty. However, Uncle Sam might come knocking with his hand out. Pull money out of a traditional IRA and expect to shell out some moolah to cover the income tax on the money. Roth IRAs aren’t subject to income tax because they’re funded with post-tax dough. Of course, like any government agency, HUD and its local municipality siblings are often tweaking, adding, and (sadly) dropping funding options. So before signing on a purchase offer’s dotted line, make sure you investigate eligibility and availability in your area to make homeownership a tad more affordable. If you are looking to buy or sell in the near future and need a good agent, please contact me at 281.704.0523 or visit my website, http://www.donnamontez.com. Author donnamontezPosted on November 30, 2016 November 30, 2016 Categories buyers, Financing, Home Buying Process, sellers, UncategorizedLeave a comment on Are You Looking To Save a Little Money on the Purchase of Your First Home? Is it time to update your kitchen before putting your house on the market? For home owners who are putting their house on the market, they may want to take a closer look at their kitchen. It can become a deal-breaker for buyers. For landlords looking to rent out the space, the same applies too. “Renovating your kitchen can make the home more appealing and allow it to command a greater rental price,” he says. But kitchen remodels are known for being pricey. Even a minor upgrade could cost upwards to $20,000. Rest assured, not all kitchen redesigns have to be expensive. A few strategic kitchen renovations can make your money stretch and still have a big impact, all for under $500. For example, painting the cabinets white may make for a modern redo. The cost of the paint will be about $150 for the cost of the paint. Add in about $100 more for new cabinet hardware and the kitchen can take on a drastically different look for under $300. A new backsplash may add more style to the kitchen space too. For example, a mosaic subway tile may add more of a modern twist. One company called SimpleMat can help DIYers install a backsplash without the use of mortar too. The cost is about $170. Take a look at the kitchen’s lighting too. Buyers love bright spaces so make sure there is ample light. Also, consider adding an LED undercabinet light to add a glow onto the kitchen cabinets. The cost is about $40. For a really dated countertop, home owners may be best off spending the money to replace it. Quartz is especially on-trend nowadays. Or in a pinch, home owners could try a top coating over their current countertops. Rustoleum’s Counter Top Coating is about $40 for a tint-base. Author donnamontezPosted on November 10, 2016 Categories Home Improvement, sellers, UncategorizedLeave a comment on Is it time to update your kitchen before putting your house on the market? Want to know some simple tips for keeping your house clean? Incorporate these simple two minute habits into your daily routine and always be ready for drop in company. Visit http://www.DonnaMontez.com or call 281.704.0523 if you are looking to buy, sell or lease in the near future. Author donnamontezPosted on October 21, 2016 Categories Home ImprovementLeave a comment on Want to know some simple tips for keeping your house clean? What Happens From Contract to Closing? Many new home buyers are not familiar with the home buying process. They rely on their Realtor for guidance throughout the process. Buying a home for first time home buyers can be a very daunting experience. In a nutshell, the following process will occur, no matter what Realtor, lender, title company, etc. is being used. Once a buyer makes the decision to purchase a property, they will seek a Realtor that suits their needs. This is not always an easy process if they do not already know of someone they feel will represent them well. The Realtor will then prepare the buyer for the house hunt by collecting appropriate information and documents that establish a Client/Realtor relationship and ensuring that the client is pre-approved for the appropriate price range for the house hunt. If the buyer has not already received pre-approval from their preferred lender, the Realtor may suggest lenders they frequently work with to assist in the process. When the buyer finds a home they would like to make an offer on, the Realtor prepares a purchase agreement (or offer) to send to the listing agent. If the offer is accepted, the contract is executed and the process begins. Once an offer is accepted, it is submitted to the lender who has provided pre-approval and the title company. Title is then opened and the contract is receipted by the escrow officer. There will be an “option period” after the contract is executed. This “option period” is the time when the buyer will get all inspections and negotiations done. Title examination begins at the title plant. This ensures that the property is free and clear of all liens and debt. The buyer’s credit history is provided to the loan officer. The appraisal is ordered by the lender. The commitment for title insurance is issued and distributed to all paties of the contract. If required, the survey of the property is ordered. The buyer’s loan is approved. The survey is reviewed by the title company and is approved for insuring purposes. The closing date is scheduled with the title company. The lender sends the closing instructions to the title company. Papers are ordered – warranty deed, note, deed of trust and other docs required by he lender, as well as pay off figures from the existing loan for the seller. The insurance binder is provided. The settlement statement is reviewed and approved by the lender then sent to all parties and agents for review prior to closing. Closing and funding at the office at the title company. Keys to the property are provided to the buyer upon funding. With the current guidelines in place, buyers can expect to close anywhere from 30-60 days after a contract has been executed. For more information and a Realtor who will put your needs first, visit http://www.DonnaMontez.com or call 281.704.0523. Author donnamontezPosted on October 20, 2016 October 20, 2016 Categories buyers, Financing, Home Buying ProcessLeave a comment on What Happens From Contract to Closing? Do you know what the color of your front door signifies? We often use color to express ourselves—in our clothes, our decor, our art. And credible psychology has linked color to certain personalities—the feelings they evoke and what they say about you. That means the color of your front door says something, too! It’s one of the first things guests see when they visit your home, so look through these 14 front door colors to make sure you’re giving off the first impression you want to send. You’re a social butterfly! Orange doors tell guests that you like to entertain, but also that you enjoy a good challenge. Traditionally, a red door signaled a hospitable home. Today a red door still says, “Welcome!” If you have a red door, you also enjoy attention and try to live their life fully. It goes hand-in-hand with entertaining. Those who paint their doors blue enjoy peace and value truth. They are well grounded and true to themselves. Gray is an indecisive color, a mix between black and white. If you paint your door gray, you are indecisive and prefer to compromise—giving both sides of an argument equal weight. Green doors suggest that traditional values lay within. The people living there are ambitious and strive for personal betterment. They’re also good with their finances, as green is affiliated with money. Homeowners who keep their doors a traditional wooden finish are generous and down to earth, like this grounded finish. They are kind and sweet and all who enter will feel welcomed. When you cross a black threshold, you are entering a world of order and control. Simple elegance graces the style within and everything is in its proper place. Just like the clean lines it creates, white doors begin a guest’s journey into simple and organized home decor. Like wood doors, brown ones signal that those within are warm, reliable and stable. Like the earth. They can keep an even head and are trustworthy. While it ups your curb appeal, a yellow door also says you’re logical while also creative. Like the color, you have a positive attitude and may even be a morning person! Turquoise may be an unusual color, but it’s perfect if you crave emotional balance, have big hopes and dreams and believe that anything is possible. In other words, you’re a romantic dreamer. A glass door symbolizes that you too are open minded, friendly and outgoing because you have nothing to hide. Needless to say, you’re a hopeless romantic. But, you’re also thoughtful, cheery and generous. Purple is a risky color because it’s not very common. It says you’re comfortable taking risks, you dream big and may even call yourself a free-spirit, and not burdened by the parameters others may set. This information was taken from Pro.com. Please visit my website http://www.DonnaMontez.com or call me at 281.704.0523 for real estate assistance. Author donnamontezPosted on October 13, 2016 October 13, 2016 Categories Home Improvement, Seasonal Home ChecklistLeave a comment on Do you know what the color of your front door signifies? Are you aware of how the lending process works? And, how the lending process ties into the home search? If you are looking to buy real estate, there are a few steps you need to know before getting started. First, you need to find an agent that will work for you in finding the best property that meets your criteria. Pre-Approval. In order to save yourself and your agent time, you must be pre-approved for a loan. If you have a preferred lender, contact them as soon as possible to submit an application which will determine the correct price range for your search. If you do not have a lender in mind, ask your agent who should be able to provide you with a list of qualified lenders.Be prepared to provide the following information when attempting to obtain pre-approval. Pre-approval will be determined within hours of receiving the required documents. If all goes well, a pre-approval letter will be issued to you and your agent. You are now ready to look for a home that is in your price range and are prepared to make an offer when you find that home. Home Search: Provide your agent with home search criteria, (preferred area/neighborhood, school district, number bedrooms, number bathrooms, etc.) and start looking for that perfect home. Your agent will provide you with a list of homes based on your criteria from which you will be able to review and preview. Once the home has been found and an offer has been made by the buyer and accepted by the seller, the loan process begins. (There are many documents and steps that the agent will be handling during the offer/acceptance period of the transaction). Accepted Offer: Once an offer has been accepted, an executed contract (signed by all parties) will be submitted to the lender and title company. Buyer provides Option Fee and Earnest Money checks with the offer. Title is opened, appraisal is ordered, documents are secured and put in place with underwriting. At this point, the buyer is in their “option period” which is the time for all inspections of the property to be handled and negotiations to be dealt with. During this time, the buyer has the right to terminate the contract for any reason without risking earnest money. If a buyer decides to terminate, the Option Fee check will be kept by the seller but the Earnest Money will be returned to the buyer. Underwriting reviews all information, checks for compliance and guideline issues, is responsible for ensuring the loan is approved. The underwriter then officially provides conditional approval of the loan based on certain conditions being met. Once the buyer has provided additional documentation, the loan is sent back to underwriting to get the “Clear to Close” status. Final Approval and “Clear to Close” happens when all conditions have been received and cleared by the underwriter. Closing instructions and documents are sent to the title company. A final settlement statement is generated. Closing: When the loan funds, documents are signed, notarized, and sent back to the lender by the title company. The lender then reviews the documents and issues money to the title company. The title company then issues all checks and provides the buyers with keys to their new home. In today’s market, this lending process can take from 30-60 days. Author donnamontezPosted on October 11, 2016 Categories buyers, FinancingLeave a comment on Are you aware of how the lending process works? And, how the lending process ties into the home search? Ready to get that house sold? If you are preparing to put your house on the market or just want to enhance the curb appeal of the home you live in, then take advantage of the tips mentioned below. Tip #1: Wash Your House’s Face.Before you scrape any paint or plant more azaleas, wash the dirt, mildew, and general grunge off the outside of your house. REALTORS® say washing a house can add $10,000 to $15,000 to the sale prices of some houses. Tip #2: Freshen the Paint Job.The most commonly offered curb appeal advice from real estate pros and appraisers is to give the exterior of your home a good paint job. Buyers will instantly notice it, and appraisers will value it. Of course, painting is an expensive and time-consuming facelift. To paint a 3,000-square-foot home, figure on spending $375 to $600 on paint; $1,500 to $3,000 on labor. Tip #3: Regard the Roof. The condition of your roof is one of the first things buyers notice and appraisers assess. Missing, curled, or faded shingles add nothing to the look or value of your house. If your neighbors have maintained or replaced their roofs, yours will look especially shabby. Tip #4: Neaten the Yard.A well-manicured lawn, fresh mulch, and pruned shrubs boost the curb appeal of any home. Tip #5: Add a Color Splash. Even a little color attracts and pleases the eye of would-be buyers. Tip #6: Glam Your Mailbox. An upscale mailbox, architectural house numbers, or address plaques can make your house stand out. Tip #7: Fence Yourself In. A picket fence with a garden gate to frame the yard is an asset. Not only does it add visual punch to your property, appraisers will give extra value to a fence in good condition, although it has more impact in a family-oriented neighborhood than an upscale retirement community. Tip #8: Maintenance Is a Must. Nothing looks worse from the curb — and sets off subconscious alarms — like hanging gutters, missing bricks from the front steps, or peeling paint. Not only can these deferred maintenance items damage your home, but they can decrease the value of your house by 10%. Author donnamontezPosted on October 6, 2016 October 11, 2016 Categories Home Improvement, sellersLeave a comment on Ready to get that house sold? Donna Montez Real Estate Blog at WordPress.com.